With the recent launch of Drum Corps International's new SoundSport and DrumLine Battle initiatives, more than 500 inquiries from enthusiastic potential participants who hail from 42 states and 17 foreign countries have been rolling in. Check out this greeting sent to us from future SoundSport participants of the Shanghai WUSI Middle School Marching Band. The oldest members of this group from China are only in sixth grade! 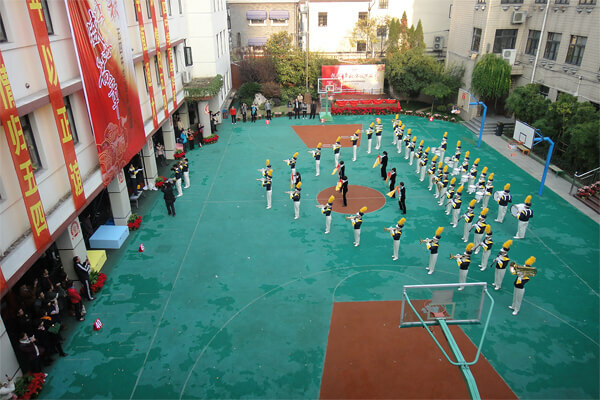 The WUSI Middle School Marching Band performs outside its school in Shanghai, China. Read more about the DrumLine Battle and SoundSport programs. Visit SoundSport® on Facebook. Visit DrumLine Battle on Facebook. Follow SoundSport® on Twitter (@SoundSport). Follow DrumLineBattle on Twitter (@DrumLineBattle). Are you interested in getting in on the ground floor of this historic new opportunity? Sign up below if you are: • A performer wanting to perform in a DrumLine Battle or SoundSport ensemble • A music educator wanting to create a fresh new opportunity for your students • A marching band association or other marching arts organization seeking additional information on these unique program offerings • A fan wanting to stay abreast of the developments of DrumLine Battle?„? and SoundSport • A potential strategic or corporate partner • Someone with a great idea on how we can make DrumLine Battle?„? and SoundSport even better Fill out this online form to be notified when additional information is available.